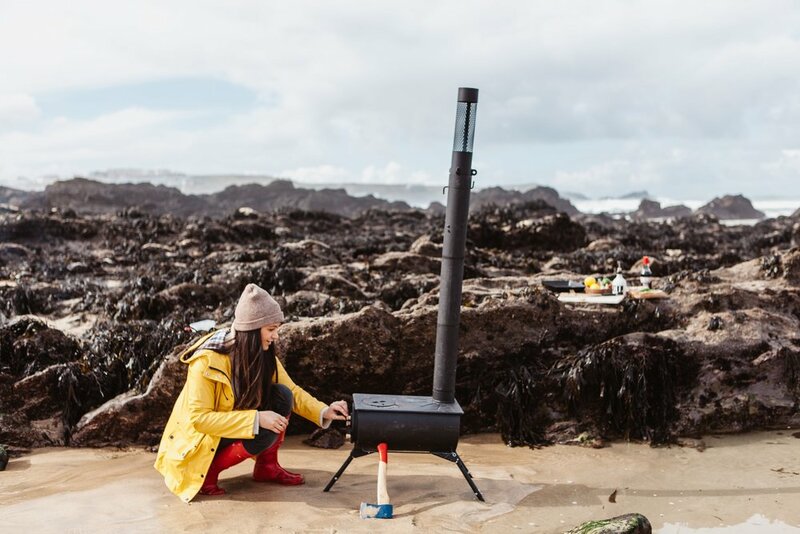 A couple of weeks ago Lizzie Churchill and I went on an adventure with our Anevay stove. A few days before our adventures had taken us to the deserted coves of the Helford River banks (Read that blog post HERE and there's another one HERE) but today's adventures were much closer to home and we found ourselves on my local beach break, and the UK's surfing mecca, Fistral beach. Ever since I read Niklas Ekstedt's book 'Food From The Fire' I have been desperate to try out steaming scallops on seaweed. The long winter didn't provide an opening for such experiments but It seemed like the stars aligned when a trip to the fishmonger was perfectly timed with a delivery of fresh local scallops and my trip to the beach was conveniently synced with low tide. Very quickly a plan came together. 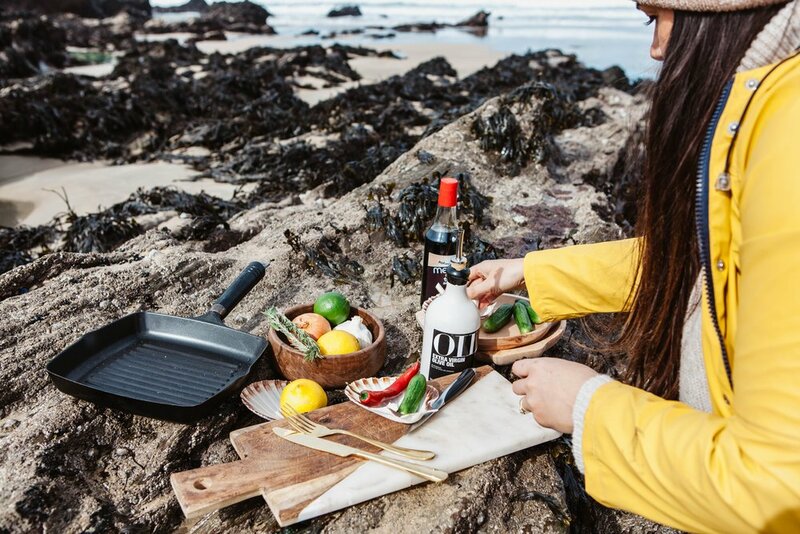 I loaded my Anevay stove with fire wood and headed off into the rock pools to forage for seaweed. The main seaweeds I found down on North Fistral beach were a few different types of wrack and some laver. Thankfully there aren't too many poisonous seaweeds around in the UK and from my own research, the only one I've found that I need to avoid is Desmarestia. Almost all UK seaweeds aren't poisonous but that doesn't necessarily mean that you can eat all of them straight off the rocks, some require hours of processing. 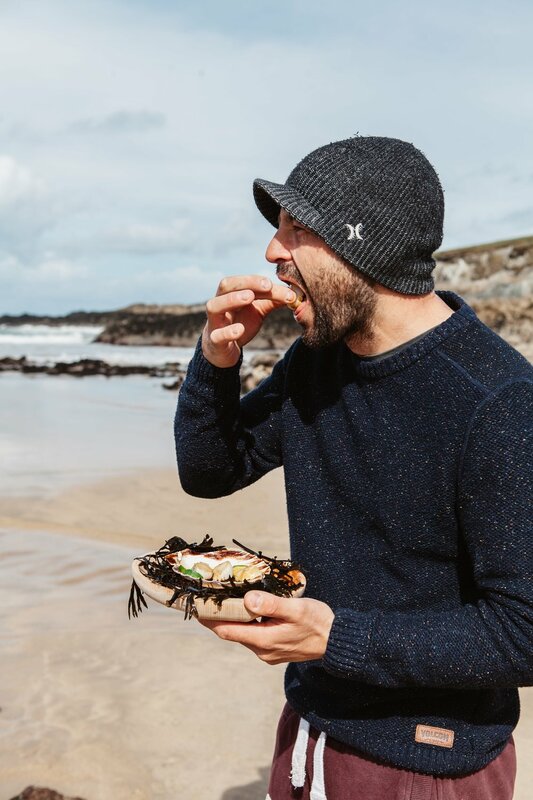 I'll leave a comprehensive seaweed foraging blog post for another time because in this specific recipe we aren't going to be eating the seaweed, just using it as a tool to cook our scallops. 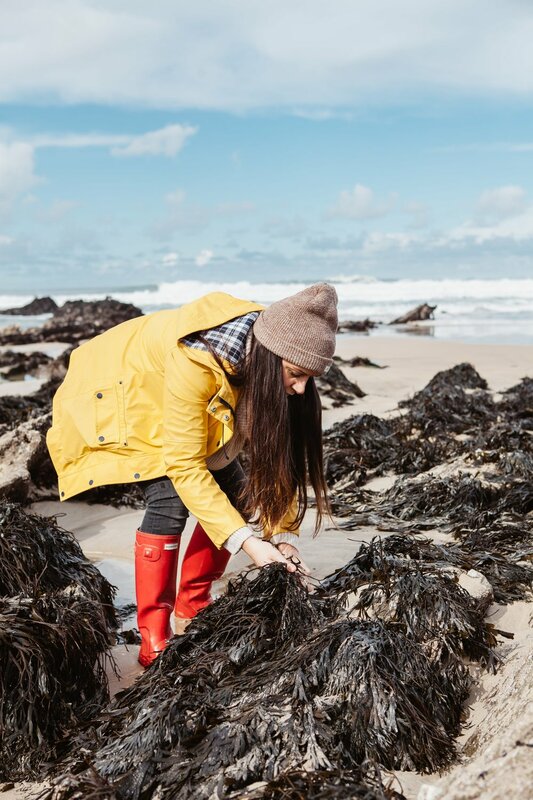 However, I will include a few quick tips for foraging seaweed. Never source seaweed for eating or cooking from the strandline. You don't know how long it has been dead for and what nasties its picked up as it's drifted into shore. 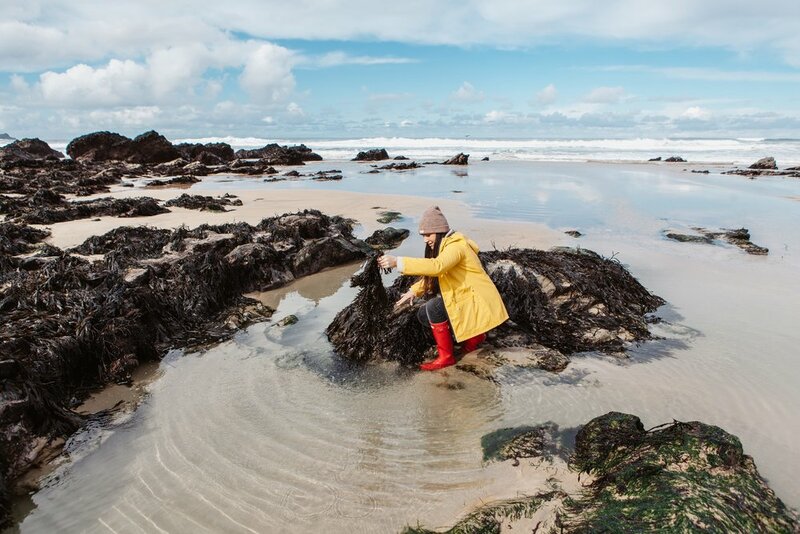 You should always gather your seaweed fresh from the rocks, ensuring that it's still attached. Cut it from the rocks using a knife and leaving the end bits still attached to the rock so that it can continue to grow. Be careful not to disturb any rocks or sealife whilst you are out foraging. If you turn a rock over for a look, make sure you turn it back and put it back in its place when you leave. I grabbed a few handfuls of wrack which I cut off the rocks and took my bundle of sea vegetables to the nearest deep rock pool where I could clean it of any sand by giving it a good few dunks. The first thing I did was give my scallops a quick sear on top of the stove to give them some colour. Then I draped seaweed over the stove and placed the scallops on top. I only left the scallops on there for around 2minutes and then flipped them for another 2minutes. The seaweed began to change colour to a bright green cabbage colour, this is perfectly normal so don't worry. The results were succulently steamed perfect scallops. The recipe in Niklas Ekstedt's book also required grilling some cucumber to go with the scallops. I've never thought of putting cucumber on the bbq or fire before so I thought I'd give it a try. I placed the cucumber directly on the stove between the gaps in the seaweed. The results? the cucumber was OK but nothing I'd rush back to try. Maybe charing it over hot coals would be better. I'll try that next time. 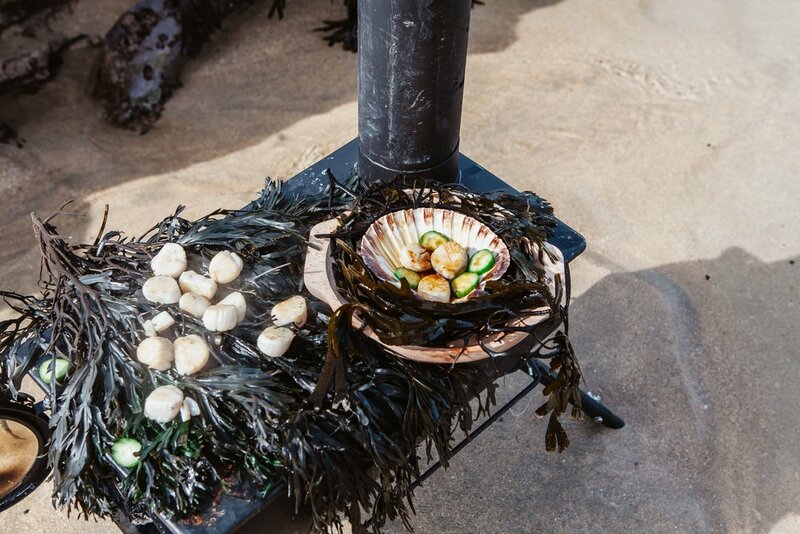 I served my scallops in a shell on a wooden plate surrounded by seaweed. I gave them a splash of soy sauce, although they didn't really need anything, and looked over my shoulder to see Leigh (my husband) standing right behind me. He'd been surfing on the beach with the boys and they'd all seen me cooking so go out of the water in the hopes of scrounging some food. I handed them a plate and they tucked in. 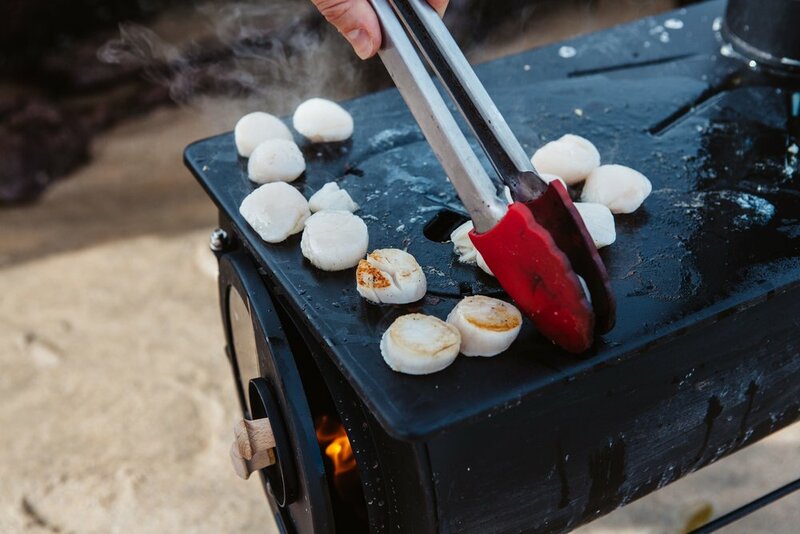 The scallops were cooked to perfection and the unique ocean flavour was amplified from cooking it on the seaweed. I'd certainly do this again and urge you to give it a go.